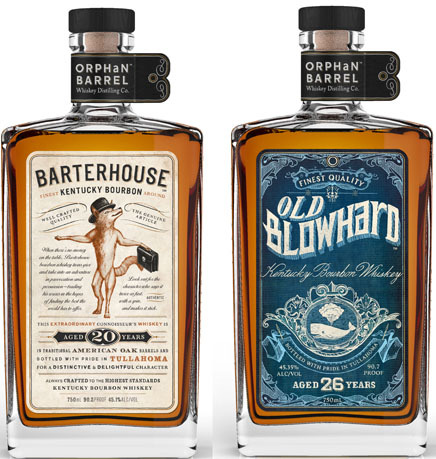 We are very proud to present Old Blowhard 26 year bourbon and Barterhouse 20 year bourbon from Orphan Barrel Distillery. Orphan Barrel takes pride in unearthing lost barrels of rare and succulent bourbons that have long been forgotten in the back of rick houses and distillery warehouses. Both of these ultra rare bourbons were discovered in barrels that had been hidden away and forgotten long ago. Therefore, there is an extremely small production of both, with The Old Blowhard being the rarer of the two. These will be both be completely out of existence very shortly. OLD BLOWHARD is a 26 year old bourbon that is bold and full of big flavors. It is an 86% corn mash Kentucky Straight Bourbon of 90.7 proof. The taste is rich and lush with hints of honey and smoke and a dry soft finish of orange peel. BARTERHOUSE is a 20 year old bourbon also of 86% corn mash. It has flavors of soft spice and butter cream with a clean finish of molasses and light spice. Both of these rare bottles stock was made at the old Bernheim distillery and was discovered in the Stitzel-Weller warehouse in Louisville, Kentucky. Only a small amount of both of these rare bourbons is available and will only be available one time. The Robusto Room is one of only two accounts in all of Colorado to have this amazing specimen and we only could secure 6 bottles of each. So once they are sold it is gone for good!